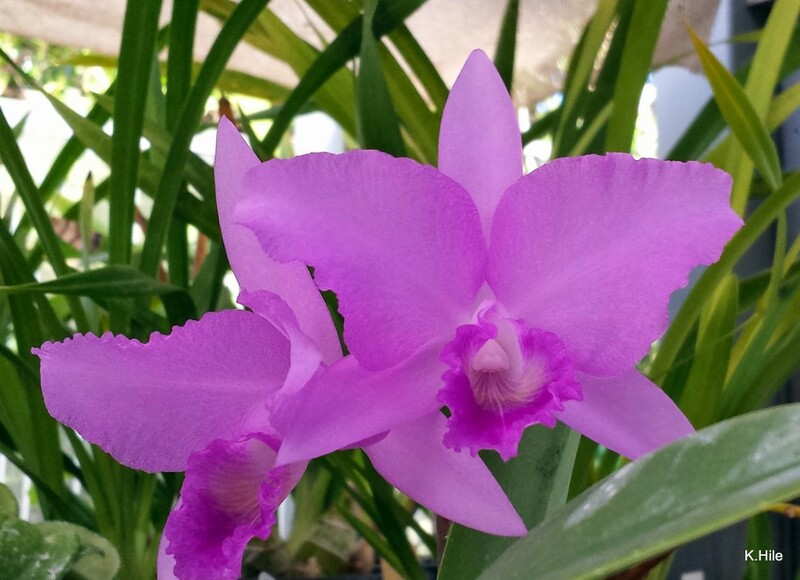 Cattleya is a tropical genus of epiphytic and lithophytic plants that produce fairly to exceptionally showy flowers, and by many their species and hybrids are considered THE orchid. There are basically two groups of Cattleyas, the so-called unifoliate and bifoliate. The species in the unifoliate group produce small to large-sized (up to 8′) flowers in colors ranging from yellow to lavender (excluding the color forms, that add a lot of variation); the plants grow fusiform pseudobulbs topped with one fleshy, flattened, elliptic leaf. The bifoliate group produces smaller flowers (up to 5′ or more, depending on the species), but in larger numbers (up to 40+ on a spike, also depending on species), in colors ranging from green to yellow to brown and pink to lavender; the plants grow tall, cylindric, pencil-like, ringed pseudobulbs that can be up to 5’+ tall in a couple of species – but in most get only to 1′ to 2′). Temperature: The vast majority of species thrive in Intermediate conditions. The Amazonian species – C. violacea, C. eldorado, C. luteola, should be grown under warm conditions. Light: Intermediate to bright, very good air movement. Water-Humidity: Seasonal, high during growth season and low during rest period (usually fall-winter). Species from the Amazon (above) prefer a more uniform watering schedule throughout the year. Cattleyas like to dry out between waterings, and it helps to grow them on the dry side during Fall and Winter. These were the plants in mind when the rule ‘when in doubt, do not water’ was created. Fertilizer: Balanced fertilizer during growth season (see above), weekly. Half to a quarter concentration during rest period (see above). Potting: Most people grow cattleyas in pots, and this is usually the ideal situation as the plants can grow large. For the small to medium-sized species, baskets and bark/cork slabs can be used, depending on particular species water needs. As for potting medium, well-drained mixes of treefern/bark with or without charcoal are preferred, ratios and grade depending on particular watering schedules and pot/plant sizes. Under heavy watering schedules, more drainage is necessary as the plants’ roots don’t like to stay soggy.